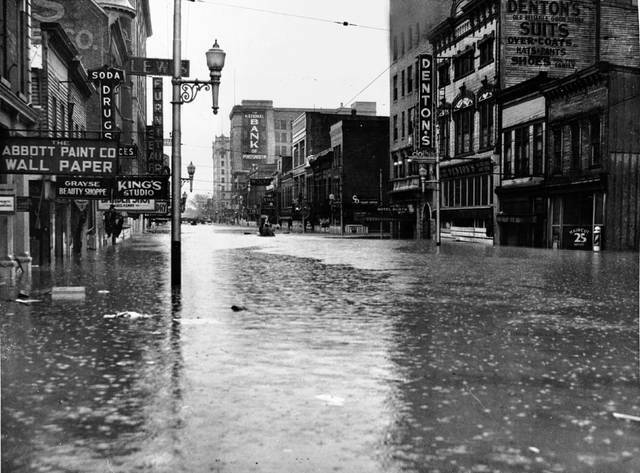 Downtown Portsmouth during the 1937 Flood. 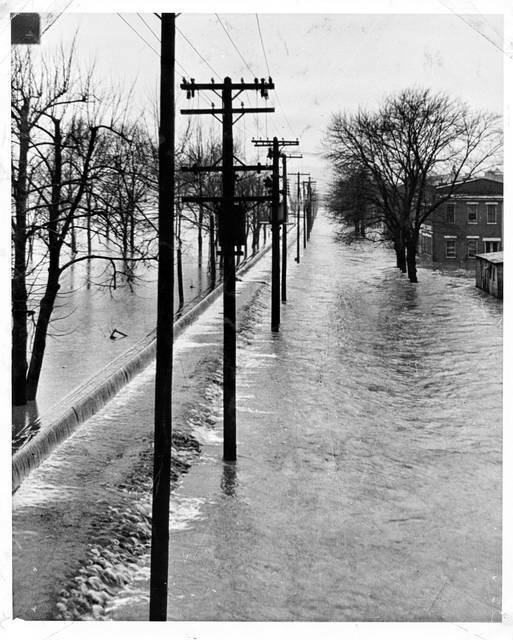 Front Street as the 1937 Flood waters from the Ohio River, as they go over the flood wall. An aerial photo of Portsmouth in the 1937 flood. The tremendous amount of water the local communities experienced last winter are nothing compared to the Winter of 1937, when it rained for most of the month of January with an estimated 13 inches over a period of 21 days. On January 21st, the Portsmouth schools were let out and closed to prepare for the flood. It was told that when the waters would go over the flood wall and the Sewer valve lines were to be opened, there would be signals sounded from the trains. Those signals were sounded out at 3:15 a.m. and the people of Portsmouth knew that the inevitable was happening. Some of the people tried to remain in their homes, but eventually had to be evacuated, others fled to friends and relatives that lived on the ‘hilltop’ in Portsmouth, and the rest, were taken in by strangers, if their homes were not overcrowded. The local schools that were on higher ground also took in the refugees from the lower parts of the city. As the water filled the lower parts of the city, entire houses were ripped off their foundations. Much of the refugees’ furniture was destroyed, even though people tried to move the furniture to the highest floor of their home or the schools. It is stated that the rains began on January 5, 1937 and continued for 22 days. On January 27, the Ohio River crested at 74.23 feet, exceeding the flood stage by more than 12 feet. As a result, more than 35,000 residents were left homeless. In a film made by John and Nathan Lorentz, called, “River Voices, A Portrait of an American River Community,” they give an account piece by piece of the Flood of 1937 story as told by some of those who experienced the Flood. This film brings to life some of the most terrifying and unbelievable events that took place before, during and after the flood. The film can be purchased at the Portsmouth Daily Times for $20. Lorentz and his son were also inspired by the resilience of the people of Portsmouth and their ability to rebuild and continue on despite the disastrous flooding. In the documentary, Lorentz compiled photographs of the flooding and affected homes, along with stories from those who experienced the flood first-hand or lived its legacy through familial stories. As a child, Lorentz grew up surrounded by stories of the flood, as his own family was affected. Lorentz was not yet born when the flood occurred, but his parents and two year old sister lived in a cottage on 4th Street during the time. Their home flooded, forcing them to higher ground. One thing that was mentioned in the film and some of the other flood stories found on the web, spoke of how radio, mainly WPAY of Portsmouth was a godsend for the people in Portsmouth during that time. Zeke Mullins, former radio announcer, speaks in the River Voices film. Only one tragic death was recorded to have happened in Portsmouth during the flood and that was Bessie Tomlin, who while in a rescue boat, the boat capsized and Tomlin fell in the icy waters. She reached up handing her baby girl, Alberta, to a rescue fireman, Walter Chick, who grabbed the toddler, but was unable to save her mother. This incident has became a legend and strong remembrance of the terror caused by the Flood of 1937. Portsmouth had experienced flooding in 1884, 1907 and 1913, but none of those were of the magnitude of the Flood of 1937. When the water crested on January 27th, there were more than 35,000 residents left homeless. The Portsmouth flood wall of today, is said to be able to handle a stage of 79 feet and are now a sight of beauty, since the painting of the murals, even one depicting the Flood of 1937.